The thing is, they are noiseless as they move, their footfalls cushioned by pads of fat behind their toes. Of course there are the low frequency stomach rumbles that maintain lines of communication across the herd, but we weren’t close enough to hear those. Or maybe we were too intent on our own stomach rumbles. We had driven out of the Mara River Camp at first light, after only a 5.30 cup of tea. Breakfast was still a distant prospect when we found ourselves among this large, slow-moving herd. They paid us no attention whatsoever. All we sensed was a wave of communal intention as they headed on through the thorn brush. In fact we were so beneath their notice, Daniel, our driver-guide, decided it would be fine to stop the truck and eat our picnic breakfast as the elephants moved on by. I remember thinking how incongruous it was to be standing out on the Mara plains eating a hard boiled egg while these majestic creatures slowly passed me. This is not to say that elephants cannot be dangerous; sometimes murderous if they bear a grudge for some harm done them; or if the bulls are in musth. But nothing was amiss this day. It was like one big family outing, the epitome of good elephantine order wherein mothers and children always come first. 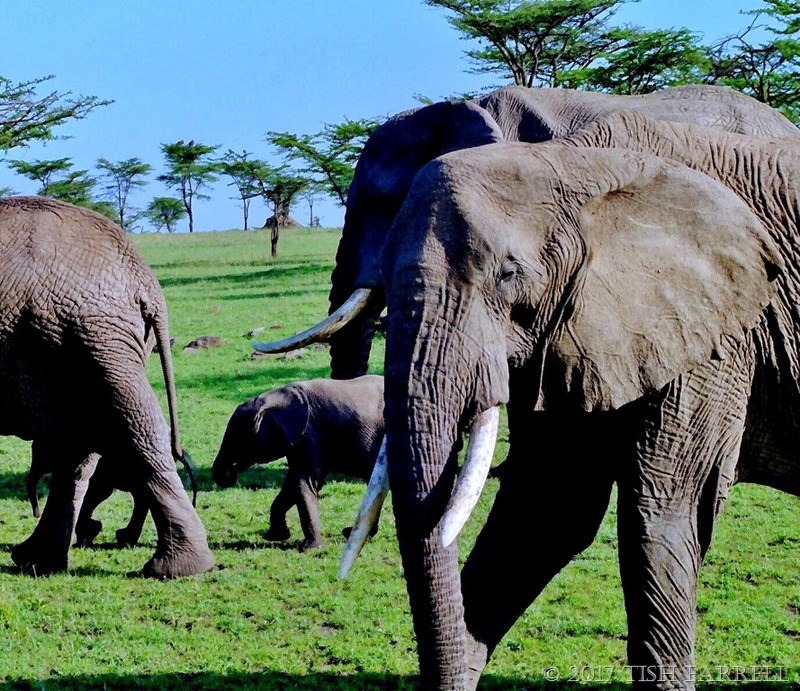 Posted on June 10, 2017 by Tish Farrell	This entry was posted in Africa, Travel and tagged DP weekly photo challenge, elephants, Kenya, Maasai Mara, Tish Farrell Writer. Bookmark the permalink. These peaceful bucolic scenes bring back unchanged memories of the past! That’s a lovely way of putting it, Anna. I read that in some areas they are painting the tusks pink. It sinks into the ivory ruining its value so poachers leave them alone. I think many animals have a universal consciousness esp whales and dolphin. But so do elephants. At one preserve when visitors approach the elephants , from a distance of course, the elephants turn around so you see only their tail end. I think they are hiding their tusks so humans can’t see them. Lots of interesting observations here, Carl. Thank you. I hadn’t heard about the pink paint dye. A simple if rather startling solution. I’ve heard the Chinese have banned ivory imports though, so should make a big difference. And yes, elephants hiding their tusks: back during Beryl Markham’s era when she was searching for elephants with big ivory by air for the likes of Bror Blixen and Denys Finch Hatton, she observed big bulls hiding their tusks in the undergrowth. What a beautiful sight to wake up too, Tish. What a treat and the elephants certainly look like majestic creatures. Hope none of them got jealous of your hard boiled egg picnic breakfast 🙂 Beautiful images and doesn’t look like they noticed you at all. Or if they did, perhaps they so you and your group as friends. I see Carl in the comments brought up the topic of painting tusks and poaching. Like you, I too have never heard of that but yes, China have been working towards banning ivory trade – a great move. Not sure if other parts of the world will follow suit (given that some rely on ivory poaching for a living 😦 ). Hopefully so. Thanks for all those kind words, Mabel. Fingers crossed about the ivory bans. Hopefully China will prompt other nations to follow suit. There is nothing better in the world than being near to these majestic creatures. My favourite African moments have been in Addo and in Chobe where watching the herds of elephants interact left me speechless. Everything in perfect order in elephant world, I wish it could always be. Yes. that’s a very big wish, Gilly. 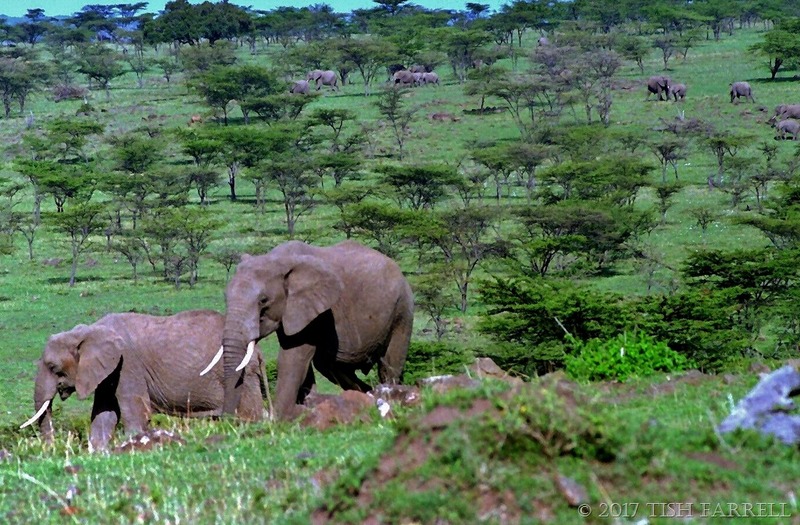 Surprising to me when in Kenya was how long it took to find a first glimpse of elephants. I’d thought they’d be everywhere. While liking for them, giraffes became my favorite jungle animal. I love visiting faraway places with you, Tish! Oh what a beautiful experience that must have been. It must have been amazing to live in Africa, and to see things like this without being on some kind of tour. Wonderful photographs too. You’re right Alison, it did make a huge difference being lucky enough to live there for seven years. I still mentally pinch myself to think this was a REAL part of our life. I keep hoping that the elephants will survive us! I’m thinking they may have a bit more of a chance with the Chinese ban. Other half tells me the bottom dropped out of the ivory market. What an absolute delight. I Houghton I’d eaten a boiled egg in a few superlative places, but this takes the cake, so to speak. A lovely profile of elephants. Thank you, Janet. I’m glad you never tire of eles, because I keep posting them 🙂 Am having a gardening weekend. Hope yours went well.